Winter is a mixed bag here in the Pacific Northwest. We just had a 12 day stretch of dry, mostly clear, brilliant, blue sky weather. It is not unusual to have a few beautiful stretches of weather during the winter. I love the clear, crisp winter days, but I also feel a sense of calm when the gray, wet days return. There is something so right about them. There is something so Pacific Northwest about them. This is home. 31 Jan	This entry was published on January 31, 2013 at 13:45. 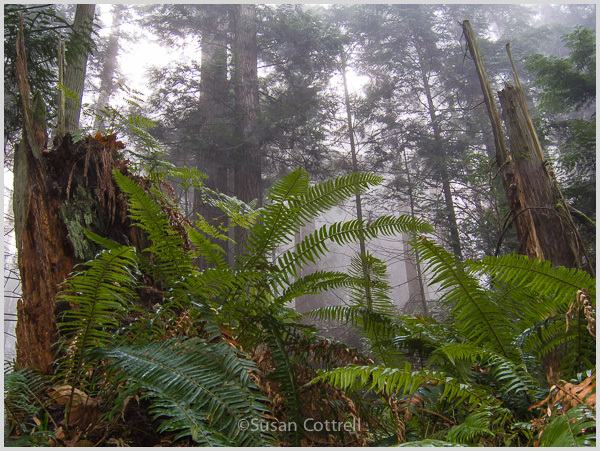 It’s filed under Nature, Pacific Northwest, Whatcom County, Woodland and tagged Douglas Fir, fern, fog, mist, natural history, nature, rain, WA, Whatcom County, woodland. Bookmark the permalink. Follow any comments here with the RSS feed for this post. I know what you mean about the gray, wet days. Unfortunately Will has the opposite reaction, no moving back anytime soon, Hawaii will have to do for now. At least you are getting lots of northwest visitors this winter. Hope that helps! I don’t mind the gray, wet days. I know the sun is just around the corner. Wonderful picture!